A clutch is a mechanical device that engages and disengages the power transmission, especially from driving shaft to driven shaft. The most common motorcycle clutch works by utilising a series of steel and friction plates/ discs stacked in an alternate arrangement that sits inside a clutch basket/ housing. The clutch basket/ drum  is rotated by the crankshaft (the bit the pistons rotate) and the steel plates sit interlocked within the basket, the friction plates  are spaced inbetween the steel/ plain plates  and interlock/ mesh with the transmission gear shaft via the clutch centre , the set of clutch plates is often referred to as a clutch pack. When the plates are compressed together, usually by a set of four coil springs  and against a diaphragm plate/ pressure plate , the force applied and amount of friction generated between the plates allows the engine to transfer its torque power to the gearshaft and when the clutch lever is used it relieves this pressure to allow the plates to separate while allowing the engine to continue running and you to change gear. The more power the engine produces the more friction is needed in the clutch plates to transfer the power, this means in the bigger bikes you’ll see bigger clutch discs as well as more of them. Also in the bigger engine motorbikes rather than using a cable from the clutch lever to operate the clutch, a hydraulic piston will be used to force the plates apart due to the increase in friction needed – much the same as your brakes. The arrangement of the plates doesn’t matter as long as each friction plate is between 2 steel plates. Clutches will generally stop working when the plates can no longer grip each other and this will happen for a variety of reasons. A multiplate clutch can either be wet or dry – A wet clutch is immersed in the engine oil to keep it from overheating from the friction produced, the oil causes the plates to slip so more plates are used as opposed to a dry multi plate clutch which as the name suggests is not immersed in oil and will typically have fewer plates also creating more noise with the need for airflow to keep the plates cool. In some cases only a single friction plate is used. The dry clutch design is prominent in Ducatis and contributes to the distinctive sound of the Ducati motorcycle. The multi-plate design starts with the clutch drum, which is sometimes called the clutch basket or clutch outer. The drum rides on a bearing or bushing that fits over the transmission's mainshaft and is coupled via the primary drive directly to the engine's crankshaft. Anytime the engine runs, the clutch drum spins with it; however, since there's no direct connection between the clutch drum and the transmission (at least not yet), you can rev the engine till it bursts and the bike won't move an inch. 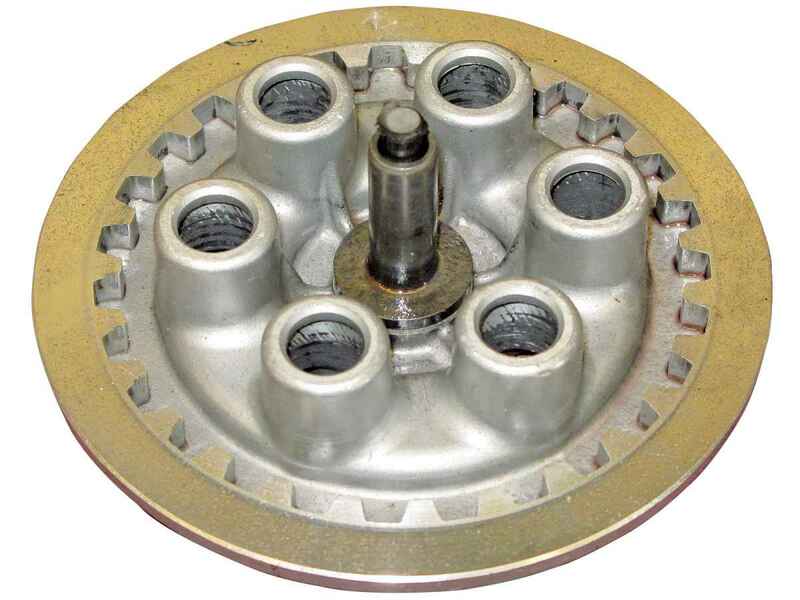 Additionally, some sort of load damper is often incorporated into the clutch drum. The damper, in the form of springs or rubber bumpers, is designed to minimize shock loadings to the driveline and engine whenever the clutch is engaged. Before we can transfer torque from the clutch drum to the transmission we'll need to add more parts, starting with the clutch center or hub. The clutch hub is positioned inside the drum and keyed to the transmission mainshaft most often by splines, although tapered shafts are sometimes used, particularly on older bikes. The hub and mainshaft turn as one, so whenever the bike is in gear, turning the clutch hub will drive the rear wheel. However, the hub and drum share no direct connection, and they'll turn independently of one another-until we link them together. Clutch plates are that link, and as you might suspect, every multi-plate clutch uses two types; the drive and the driven plates, or as they're more commonly called, friction and steel plates. The friction plates have tangs along their outer edge that engage with slots cut into the clutch basket. When the engine and basket turn, so do the friction plates. Typically, friction plates are surfaced on both sides with a composite material similar to brake pad lining, although Kevlar and ceramics are also used for high-performance applications. The driven plates are customarily stamped from steel, and have their centers notched. The notches line up with splines cut into the hub, so anytime the hub rotates the driven plates turn with it, and vice versa. The plates are installed in an alternating pattern. First comes a drive plate, then a driven one, and so on until the entire assembly, or "clutch pack" is in place. As a point of interest, the terms 'discs' and 'plates' are used interchangeably. Some guys call the friction plates "clutch discs" and refer to the driven plates as "clutch plates," while just as many call them all clutch plates and differentiate between the two by identifying them as fibers (or frictions) and steels. I'll also mention that many motorcycle clutches incorporate things like "anti-judder" plates or anti-stick springs. Sometimes a particular clutch may have plates that tend to engage intermittently, and this can be exacerbated by a particular engine or driveline design. If judder is present during the design stage, the manufacturer will often incorporate a specially designed plate to eliminate the problem. Likewise, some clutches have a tendency to stick, particularly when they're cold. In those cases, the designer may install anti-stick springs-resembling large O-rings-between the plates to prevent them from binding. Anti-judder and anti-stick springs aren't found in all clutches so don't be too concerned if you dismantle yours and can't find either. At this stage, running the engine will cause the clutch drum and its drive plates to turn, which will then try to drag the driven plates and hub along with it. Unfortunately, there's not enough friction between the plates to accomplish anything except create heat and make noise. What we need is something that allows us to lock and unlock the plates together as required. That something is the pressure plate, which works in conjunction with the clutch springs to accomplish the task. As a rule, the pressure plate will be located at the top of the clutch pack (though some designs place it at the bottom) and in most instances, the plate will also have a mechanical connection to the clutch hub. Most often, several small coil springs are positioned evenly around the pressure plate's circumference. In this arrangement, the springs are held in place by bolts that pass through them and the pressure plate into the clutch hub. Alternatively, one large diaphragm spring fitted atop the pressure plate may be used. These have grown in popularity, mainly because they provide lots of pressure at the clutch without requiring a Godzilla-like grip at the lever. The springs do the heavy lifting. When the clutch is engaged, springs apply tension to the pressure plate, which in turn compresses the drive and driven plates together, causing the basket and hub to turn as one. 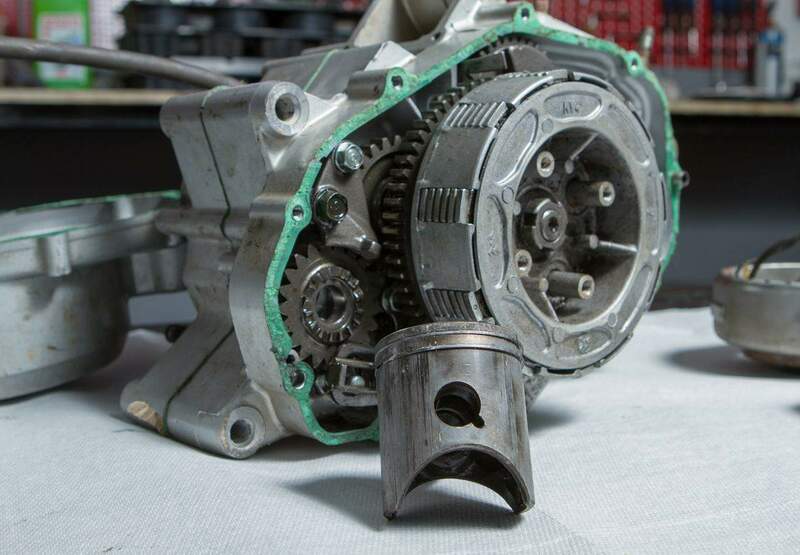 Power flows from the crankshaft to the clutch basket, through the drive plates to the driven plates, and then from the driven plates to the clutch hub and into the transmission. Pulling the clutch lever causes the clutch release mechanism to work against the pressure plate compressing the springs. As the springs compress, the tension placed by the pressure plate against the clutch pack is relieved. Without spring tension to hold them together, the plates are free to slip past one other, which disconnects clutch basket from the hub, and the engine from the transmission. Understand that it doesn't take much to relieve spring tension; as soon as the clutch release pushes against the pressure plate and those springs start to compress we only need a few thousandths of an inch between the plates before they disengage. "Working side of a pressure plate"